The bright (lower) row of colored squares are (left-to-right): 255R and 255G [100% Yellow in CMY system], 255G and 255B [100% Cyan in CMY System], 255G, 255R and 255G [100% Magenta in CMY system], 255R, and finally 255B. The gray scale bars range from 0 (100% Black) to 255 (100% White). 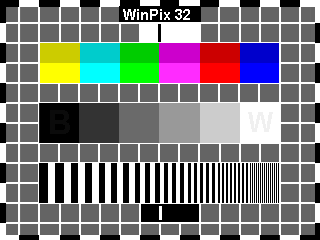 The black square has a letter "B" at RGB 11,11,11 in it; the white square has a letter "W" at RGB 240, 240 240 in it. Depending on the brightness and gamma characteristics of your monitor, you may not see one or both of the letters. This target tests the ability of your system to reveal detail in the extreme dark and light parts of an image. The third row of vertical stripes of varying width alternate between 100% black and 100% white. The background of this screen has been set to 17% grey (RGB 211,211,211) . Most camera light meters are calibrated to this as the average brightness in a scene. Depending on the settings and characteristics of your monitor , this background may not look anything like a standard photographic grey card, but it's supposed to.